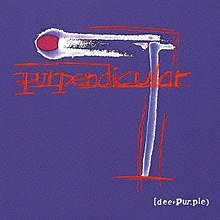 Purpendicular is the fifteenth studio album by the English rock band, Deep Purple. Released in 1996, it is their first album with guitarist Steve Morse from Dixie Dregs, who replaced Ritchie Blackmore; Blackmore, meanwhile, resurrected Rainbow and released the album Stranger in Us All. It was recorded at Greg Rike Productions, Orlando, Florida, February to October 1995 and engineered by Darren Schneider and Keith Andrews. It had a more experimental approach than previous albums. The arrangement to "The Aviator", for example, employed an acoustic folk/country arrangement that had not been heard on the band's previous work since "Anyone's Daughter" from Fireball. Several of the songs, such as "Vavoom: Ted the Mechanic" featured smaller keyboard parts, and mainly center on the guitar parts. Another new addition to the guitar playing was the use of pinch harmonics, very notably used on "Vavoom: Ted the Mechanic" and "Somebody Stole My Guitar". "Sometimes I Feel Like Screaming" and "Vavoom: Ted the Mechanic" remained regular features in Deep Purple's live setlist in recent tours. Like the title of the band's following album, Abandon, Purpendicular is a pun; in this case, based on the band's name and the word "Perpendicular". All tracks written by Ian Gillan, Roger Glover, Jon Lord, Steve Morse, Ian Paice. 13. "Don't Hold Your Breath"
^ Bowling, David (14 February 2017). "Music Review: Deep Purple – Purpendicular". Blogcritics. Retrieved 14 February 2017. ^ Popoff, Martin (1 August 2007). The Collector's Guide to Heavy Metal: Volume 3: The Nineties. Burlington, Ontario, Canada: Collector's Guide Publishing. pp. 109–110. ISBN 978-1-894959-62-9. ^ Ladano, Mike (14 January 2015). "Review: Deep Purple - Purpendicular (1996 US bonus track)". Mike Ladano.com. Retrieved 14 February 2017. ^ "Deep Purple – Purpendicular (album)". Swedishcharts.com. Media Control Charts. Retrieved 14 February 2017. ^ "Deep Purple - Purpendicular (album)". Finnishcharts.com. Media Control Charts. Retrieved 14 February 2017. ^ "Deep Purple – Purpendicular". Austriancharts.at (in German). Media Control Charts. Retrieved 14 February 2017. ^ "Deep Purple – Purpendicular". Hitparade.ch (in German). Media Control Charts. Retrieved 14 February 2017. ^ "Album – Deep Purple, Purpendicular". Charts.de (in German). Media Control Charts. Retrieved 14 February 2017. ^ ディープ・パープルのアルバム売り上げランキング (in Japanese). Oricon. Archived from the original on 5 June 2014. Retrieved 1 March 2014. ^ "Deep Purple – Purpendicular (album)". Norwegiancharts.com. Media Control Charts. Retrieved 14 February 2017. ^ "Deep Purple - Purpendicular". Ultratop.be (Wallonia) (in French). Media Control Charts. Retrieved 14 February 2017. ^ "Deep Purple Official Charts". Official Chart Company. Retrieved 5 February 2017. ^ "Deep Purple – Purpendicular". Dutch Charts.nl (in Dutch). Media Control Charts. Retrieved 14 February 2017. This page was last edited on 1 March 2019, at 23:48 (UTC).